The Caribbean is a favorite tropical destination. One of its popular island is Jamaica with its tropical climate and long stretches of white beaches. 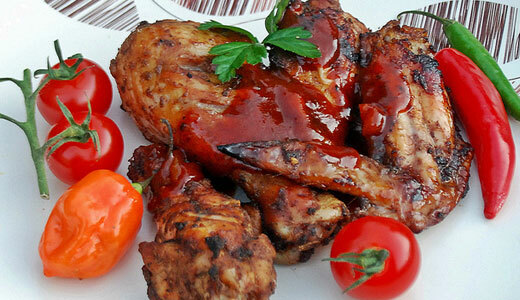 Jamaican cuisine is as diverse as the number of inhabitants that have invaded and lived in the island. The cooking techniques, ingredients, and flavors have been fused together to create such a cuisine including those techniques and ingredients that originated from the island itself. 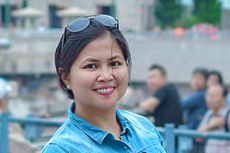 Looking forward to another food experience in one of your travels? 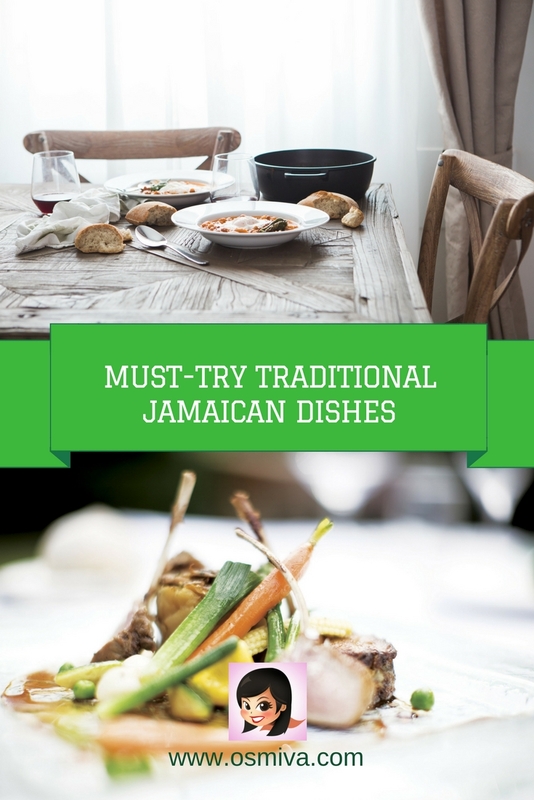 Let this post on Traditional Jamaican Dishes help you decide on what to look for when dining in Jamaica. Ackee and Saltfish is often regarded as the Jamaican national dish. 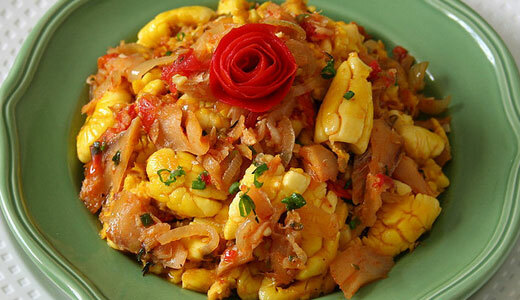 Saltfish is boiled down and sauteed with boiled ackee, onions, and sometimes with pepper, tomatoes and spices. It can also be mixed with boiled bananas, dumplings or roast breadfruit and looks like scrambled eggs when cooked. Slow cooked feet of the chicken to make soup. Pumpkin, carrots, potatoes, cho-cho, yellow yam and a packet of soup powder mix that comes in different flavors are added. 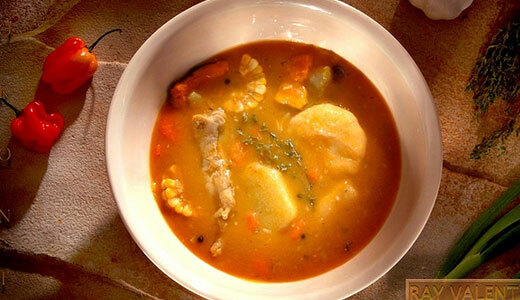 Some soup contains green/yellow banana, dumplings and special spices. 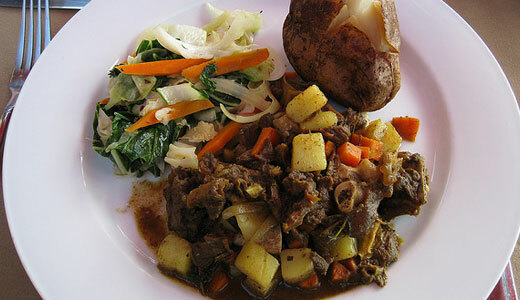 Jamaican curried goat is a traditional dish that is usually eaten during important family events or functions. 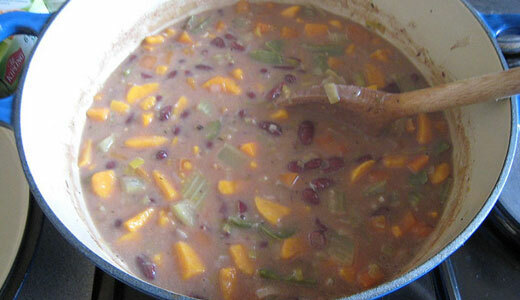 The dish may be served with rice and peas. Jamaican curry powder is an assortment of toasted spices grounded to make the base. Cayenne pepper can also be added to increase the spice. A bammy is a traditional Jamaican cassava flat bread. The root of the cassava is usually grated or milled, squeezed dry and them made into flat (1/2 to ¾ in thick cakes). 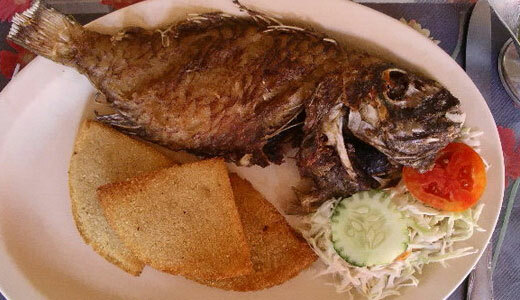 It is a tasty food and is served with fried, steamed or roasted fish. 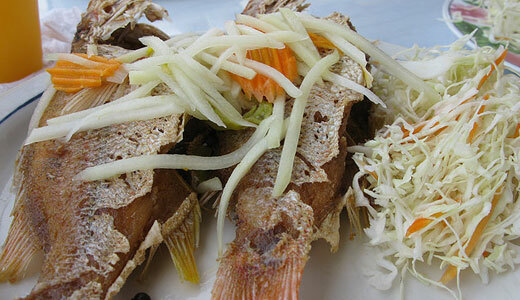 This is a traditional fried snapper dish, topped with spicy, lightly pickled vegetables. 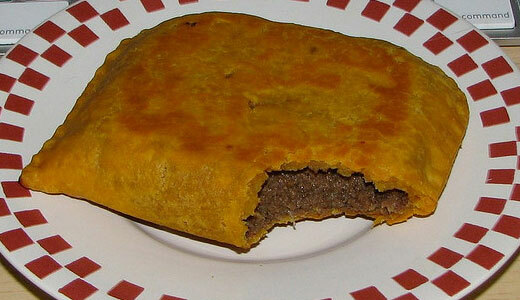 The beef patty of the Jamaican Beef Patty is has flaky crust filled with a variety of different fillings. Common fillings would be beef, chicken, shrimp, lobster and even fish. The dish is often paired with tasty cocoa bread. A popular choice in restaurants, the Jerk Chicken’s name is derived from the Jamaican jerk spice, a flavorful mixture that is used to marinate the chicken. The spice is made up of a combination of cinnamon, cloves, ginger, thyme, garlic, pepper and nutmeg. The dish is served jerk pan style or authentic original style roasted over coals on top of the pimento wood. Usually made with salt beef and or pig tails. The dish is made with the peas, taro, yellow yam, dumplings and scallion, pimento, thyme and pepper. Coconut milk may also be added. The soup is a dish by itself.